Motto: "A Great Place To Grow"
As of the census of 2010, there were 81,405 people residing in the city. The population density was 930 people per square mile (360/km2). There were 33,178 housing units in the city. Most residents self-identified as white. Less than 10% self-identified as black or African American, Native American, or Asian. A small portion self-identified as Hispanic or Latino. The population was 48.4% male and 51.6% female. The median age of residents was 34.8 years, lower than the Oklahoma median age of 40.6 years. The estimated median household income in 2011 was $66,535, up from $54,556 in 2000, and higher than Oklahoma City. Edmond, Oklahoma Territory, 1891. Drawn by T.M. Fowler. The Santa Fe rail line in Oklahoma Territory, established a water and coaling station for steam engines at this location when the Santa Fe Railroad built into Indian Territory in 1887. The site for the station was chosen because it was the highest point on the line in Oklahoma County; train could more easily accelerate going downhill while leaving the station in either direction. The railroad then named the station for Edmond Burdick, the Santa Fe’s traveling freight agent. When the town was formed after the Oklahoma Land Run of 1889, early settlers decided to adopt the name. Though most of the remnants of the old railroad infrastructure are gone, the Santa Fe, now BNSF, freight line still runs through the same course. The town of Edmond sprang up overnight during the great Oklahoma land run on April 22, 1889, when homesteads were staked around the Santa Fe station. The original plat for Edmond was prepared by the Seminole Town and Development Company, a newly formed syndicate with ties to the railroad. Many of the original streets were named for men associated with either the Santa Fe Railroad or the town syndicate. The first mayor and city officers were elected in May 1889, and Edmond’s population was 394 in the 1890 census. The first public schoolhouse in Oklahoma Territory, completed in August 1889, is in Edmond. It still stands as a historic monument on 2nd Street between Boulevard and Broadway and is open to the public on the first two Saturdays of each month or by appointment. St. John the Baptist Catholic Church, the first church opened after the land run, was located on the southwest corner of East First and South Boulevard. The congregation still exists, although not in its original building or location. In December 1890, the territorial legislature established three universities: the state university in Norman, the agricultural and mechanical college in Stillwater, and a "normal" or teaching school in Edmond. The first classes for the Territorial Normal School (University of Central Oklahoma) were held November 9, 1891, in the Methodist Church on the southwest corner of North Broadway and West Hurd. Old North, the Territorial Normal School’s iconic first building, was opened for classes on January 2, 1893, and ahead of Oklahoma State University’s Central Hall or Oklahoma University's Science Hall. The Edmond Sun, established by Milton W. "Kicking Bird" Reynolds on July 18, 1889, is the state's oldest continuous newspaper dating from Oklahoma Territorial days. Edmond was the site of the post office massacre on August 20, 1986, in which 14 people were killed and six wounded by Patrick Sherrill, an ex-postman who then committed suicide. This event was the first in a string of postal employee murder-suicides throughout the U.S and remains the deadliest. A memorial to the victims of that tragic event stands outside of the U.S. Post Office in downtown Edmond. Edmond is the home town of Olympic gymnast Shannon Miller, America's most decorated Olympic gymnast. She won five medals (2 silver, 3 bronze) in the 1992 Summer Olympics and 2 gold medals at the 1996 Summer Olympics. Interstate 35 has been designated as the Shannon Miller Parkway from the Memorial Road exit to the Logan/Oklahoma County line. The city was also the subject of a U.S. Supreme Court case in which a Christian cross was depicted on the city seal, raising issues concerning the Establishment Clause of the U.S. Constitution. In May 1996, the Supreme Court let stand a Federal Appeals Court ruling ordering the city to remove the cross from the seal. A replacement icon has yet to be agreed upon, resulting in the curiously vacant spot on the city's seal. A memorial service for famed Oklahoman baseball player Bobby Murcer was held in Edmond on August 6, 2008, at the Memorial Road Church of Christ. Among the some 2,000 attending the memorial were Reggie Jackson, Derek Jeter, Andy Pettitte, and current Yankees manager Joe Girardi. 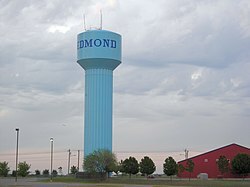 In 2009, Edmond appeared on Newsmax magazine's list of the "Top 25 Most Uniquely American Cities and Towns," a piece written by current CBS News travel editor Peter Greenberg. In determining his ranking, Greenberg cited the city's 10-day LibertyFest event, which includes the state's largest parade, as well as fireworks, a beauty pageant, kite festival, and rodeo. The supermarket chain Homeland is based in Edmond. The University of Central Oklahoma, one of the fastest growing in the state, is a major employer. The city's economy is centered on technology, manufacturing, construction, wholesale, and retail trade. Deer Creek Middle School became a National Blue Ribbon School of Excellence in 2002. Edmond Memorial High School became a National Blue Ribbon School of Excellence in 2001. Edmond Memorial High School was named the Siemens Foundation 2007-2008 award winner for the state of Oklahoma. This award is given to one high school per state, and only .033 high schools in the nation, in recognition of outstanding performance in AP math, science, and technology. Edmond North High School became a National Blue Ribbon School of Excellence in 2007. Edmond Santa Fe High School became a National Blue Ribbon School of Excellence in 2012. The city of Edmond is making efforts to promote public art with murals, stained glass and steel sculptures. On a portion of mainstreet, statuary lines nearly every corner. On July 4, 2007, the City inaugurated a bronze statue of Nannita R.H. Daisey, believed to be the first woman laying claim on Oklahoma land in the first (1889) land run. Rugby union is a developing sport in Edmond as well as in the Oklahoma City metropolitan area. Edmond boasts two rugby clubs: The Edmond Rugby Club (aka "The Storm") and the University of Central Oklahoma Rugby Football Club. Garrett Richards is a Major League Baseball player for the Los Angeles Angels grew up and graduated from Edmond Memorial High School in 2006. Major League Baseball player Dusty Allen (San Diego Padres and Detroit Tigers) graduated from Edmond Memorial High School. Actor Jim Beaver (star of Deadwood and Supernatural) lived in Edmond 1971-1976. Robert Galbreath, Jr. (1863-1953), lived a short time in Edmond, where he served as deputy U.S. marshal and as Edmond's postmaster. Pro wrestling superstar Charlie Haas graduated from Edmond Memorial High School in 1991. National Football League player Reggie Smith graduated from Edmond Santa Fe High School in 2005. Several golf PGA Tour players call Edmond home, as does the well-known Oak Tree National. Edmond's golfers include Bob Tway, Doug Tewell, Scott Verplank, David Edwards and Gil Morgan. Former Federal Emergency Management Agency (FEMA) Director Michael Brown interned in the city's Emergency Management Department while receiving a B.A. in public administration/political science from Central State University (now the University of Central Oklahoma), in Edmond. Brown was employed by the City of Edmond as the Assistant to the City Manager. Music industry figures Mike Kennerty and Chris Gaylor of the pop rock group The All-American Rejects, and Mikaila. World-champion gymnast Shannon Miller attended Edmond North High School. Retired Baltimore Ravens' noseguard, Kelly Gregg, was an All-State Football player and wrestler for Edmond Memorial and Edmond North. Blake Griffin, forward for the Los Angeles Clippers graduated from Edmond's Oklahoma Christian School. Actress Hayley McFarland An American Crime, Gilmore Girls, United States of Tara, and Lie to Me grew up in Edmond. Bill Self, the head coach of the University of Kansas basketball team, was Oklahoma Player of the Year in basketball in 1981 while playing at Edmond Memorial High School. Greyson Chance Internet celebrity and recording artist went to Cheyenne Middle School, 2010. Brandon Weeden, graduated from Edmond Sante Fe; drafted by the New York Yankees. Returned to Oklahoma State University where he started at quarterback. Drafted by the Cleveland Browns. Oklahoma Thunder point guard Russell Westbrook owns two homes in Edmond. Johny Hendricks- UFC Welterweight Champion, Graduated From Edmond Memorial High School 2002. ^ a b c "American FactFinder". United States Census Bureau. http://factfinder2.census.gov/faces/nav/jsf/pages/index.xhtml. Retrieved 2014-08-30. ^ "Ecoregions of Oklahoma". ftp://ftp.epa.gov/wed/ecoregions/ok/ok_front.pdf. Retrieved October 1, 2013. ^ Bob Hersom (2008-08-06). "Late Yankee slugger Bobby Murcer's life celebrated in Edmond". NewsOK.com. http://newsok.com/late-yankee-slugger-bobby-murcers-life-celebrated-in-edmond/article/3279914. ^ Greenberg, Peter. "Newsmax Magazine Rates the Top 25 Most Uniquely American Cities And Towns". http://www.newsmax.com/Slideshows/Newsmax-Magazine-Rates-the-Top-25-Most-Uniquely-Am/97791/19--Edmond,-Okla-/20. Retrieved 16 January 2014. ^ EdmondSchools.Net (2007). "Edmond Memorial Wins Prize". http://edmondschools.net/Default.aspx?alias=edmondschools.net/memorial. Retrieved 2007-01-15. ^ "2007 Blue Ribbon Schools" (PDF). http://www.ed.gov/programs/nclbbrs/2007/2007-schools.pdf. ^ "2012 Blue Ribbon Schools" (PDF). http://www2.ed.gov/programs/nclbbrs/2012/national.pdf. ^ Edmond Convention and Visitors Bureau (2007). "Oklahoma history cast in bronze". http://www.visitedmondok.com/publicart.htm. Retrieved 2007-10-18. ^ Houghton, Jaclyn (2007-03-13). "Oklahoma history cast in bronze". http://www.edmondsun.com/local/local_story_072094452.html. Retrieved 2007-10-18. ^ O'Dell, Larry. Encyclopedia of Oklahoma History and Culture. "Galbreath Robert (1863 - 1953)." Retrieved May 12, 2014. This page uses content from the English language Wikipedia. The original content was at Edmond, Oklahoma. The list of authors can be seen in the page history. As with this Familypedia wiki, the content of Wikipedia is available under the Creative Commons License.